In Because I Said So! 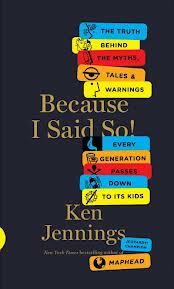 : The Truth Behind the Myths, Tales, and Warnings Every Generation Passes Down to Its Kids Jeopardy champion Ken Jennings examines the scientific evidence around 125 different Mom-and-Dad-isms and rates each as true, false or somewhere in the middle. 1. "Breakfast is the most important meal of the day." 2. "Chicken soup will help you feel better when sick." Mostly True: "Don't pop a blister." 1. "Feed a cold, starve a fever." 2. "Don't talk to strangers, it's dangerous." 1. "No swimming after eating or you'll cramp up." 2. "Don't cover a cut with a band-aid, air makes it heal." 3. "Bone and joint pain in kids can just be growing pains." 4. "If you crack your knuckles, you'll get arthritis." 5. "Young kids shouldn't lift weights as it will stunt their growth." 6. "You need to drink 8 glasses of water a day." 7. "You should clean your ears out with Q-tips." 8. "Reading in low light will hurt your eyes." 9. "It's bad for kids sit close to the TV when watching." There were certainly some interesting dogmas looked at, just it felt less like a book and more like a list to peruse for the ones of personal interest (which of course isn't a terrible thing).